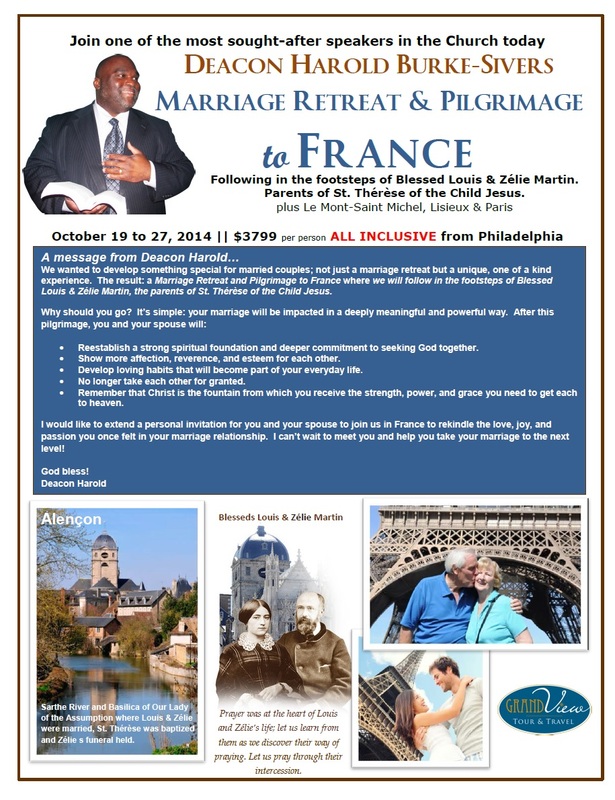 Marriage Retreat and Pilgrimage to France in October! This October 19th-27th join me on a spiritual journey as we follow in the footsteps of the family of St. Therese of Lisieux! Reestablish a strong spiritual foundation and deeper commitment to seeking God together. Show more affection, reverence, and esteem for each other. Develop loving habits that will become part of your everyday life. No longer take each other for granted. Remember that Christ is the fountain from which you receive the strength, power, and grace you need to get each to heaven. I would like to extend a personal invitation for you and your spouse to join us in France from October 19-27, 2014 to rekindle the love, joy, and passion you once felt in your marriage relationship. I can’t wait to meet you and help you take your marriage to the next level! For more information, visit Grand View Tours or click on the flyer below. SPACE IS LIMITED. DON’T WAIT. BOOK YOUR TRIP TODAY!